❎ Not Verified | Travelled with Jet2 to Tenerife on the 21 Dec 2017 returned on the 4th January 2018 first impressions on boarding the aircraft was how smart it looked with the red and grey seats we were seated in row 3AB once seated we noticed that the legroom was ok however I'm 5ft 6inch and my partner is 5ft 10 inch and broad build, The seats have been designed to create an optical illusion that you have moor space by reducing the thickness of the seat together with reducing the armrest size and table size? the back of the seat looked like it was made of tin and unfinished as if they were off an old Russian plane with a glass holder handy as you couldn't put a class on the table as it was so small once you put your meal box on it the seats were hard to sit on for a 4;30 flight and had no elbow room to eat any food, not comfortable at all. ✅ Trip Verified | Leg room was decent. Padding not so great on the seat, was ok for a 3 hour flight. Wouldn't want to travel much further on it. No pockets on back of seats for storing items. There was a drinks holder but only good for plastic cups the airline provides. Seat was very cold (5a) window blinds did not shut and very cold draughts. "we had paid for extra legroom"
We always have extra legroom seats when flying more than a couple of hours and going out from East Midlands to Tenerife we had row 17 which was fine we could fully stretch out legs and we're comfortable. Coming back from Tenerife to East Midlands we were in Row 2 and we had a dividing board in front - we couldn't fully extend out legs and I am only 5 foot 4 inches tall. If I hadn't paid for the extra legroom in exit seats then it wouldn't have been an issue but we had. I am not sure two is classed as extra leg room but my interpretation was you could fully extend your legs out in front of you. I have no complaints with the flights, boarding, seat space etc. but I am very cross about the seats that we were allocated on our return flight. 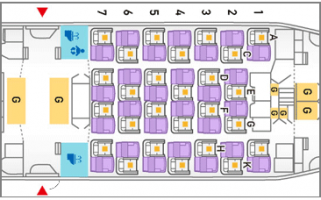 4 seats on rows 2, 9, 10 and 15. We had our 2 children (13 and 11) travelling with us. When we checked in they changed our seats to 4 in a row: 3 and a 1! Fabulous but the fact that we had 4 single seats given by the website is terrible especially as we had 2 children with us. They didn't even give us 2x2's so that we could each sit with one of our children when obviously they had seats left. Not happy about this at all. On the way out, we had a 2 and 2 singles but someone moved to allow one of us to sit with the children. Thank you to that lady who moved! My complaint is that Jet2 use its seating policy to virtually force passengers to pay for seating. My wife and I were travelling to Italy and on the way there our allocated seats were in the same row, but we were in opposite aisles. On the way back my wife was seated in R0w 15 and I was in Row 21! This has not happened to us using any other airline, including budget airlines like Easyjet, Ryanair and BMI Baby. When I contacted Jet2 to complain the only option thay gave me was to pay. Jet2.com Boeing 737-800, and the plus points were there was plenty of legroom and the seats don't recline and also have a cup holder. Minus points are the seats are very hard but as most of the flights are less than 4 hours shouldn't be too much of a problem. "exit row seat, plenty of room"
Hand baggage only between Palma and East Midlands, with pre-assigned window seat. Boarding seems to take so much longer, maybe priority boarding for a supplement would help? On check-in was advised my window seat had been reassigned to keep a family together. This was no issue for me and I ended up with an exit row seat, plenty of room. Seats do not recline and are very uncomfortable. There was no entertainment. "all leg room you could want"
Newcastle to Palma on Boeing 737-800, Seat 1a. This front row seat gives all leg room you could want. No entertainment, catering not bad prices. Seat could do with more cushion foam, got hard and hot after about two hours - overall a mid score is about right. Return on a old Boeing 737-300, as engine fault meant a three hour delay - aircraft was 29years old. Sat in Seat 1F (window) okay for leg room, seat again lacked seat cushion padding. Staff on both flights very good. Spent 4.5 hours on flight from Bodrum to Manchester on the most uncomfortable seats ever hard plastic no recline and limited leg room never ever again!